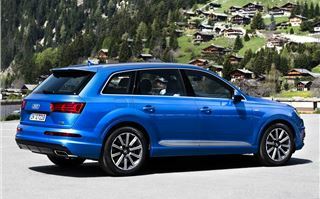 We’ve had a long wait for the second-generation Audi Q7. The original model first went on sale 10 years ago and received very little in the way of updates, while in the same time rival BMW rolled out not one, or two, but three generations of X5 and Land Rover is on its second Range Rover Sport. But that didn't stop us buying the Q7. We continued to be seduced by its smart looks, great build and - crucially - the fact it had seven seats. For its whole life it’s been a posh alternative to a dull MPV, but with almost all of its new rivals such as the Range Rover Sport now offering seven seats, it’s time to pension off the first version and introduce something more competitive. Getting off to the best possible start, the all-new Q7 premieres Volkswagen Group’s new lightweight, stiff MLB platform that will also soon underpin everything from the next Volkswagen Touareg, Porsche Cayenne and even Bentley’s Bentayga. Audi has also put the Q7 on a diet and managed to make the new one a mighty 325kg lighter than before - if you delete the 80kg standard second row of seats. Few will, but even with a saving of 245kg there’s been a huge gain in performance and efficiency despite looking as large as ever. 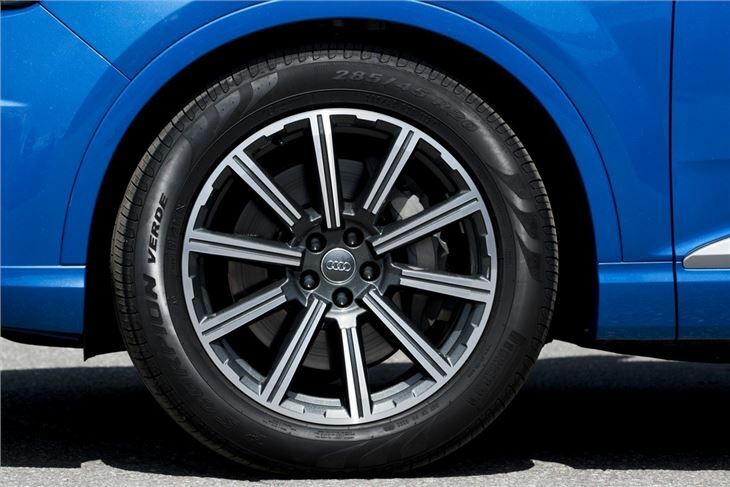 Speaking of which, the new Audi Q7's looks proved controversial when first revealed. But it's easy to criticise a photo. 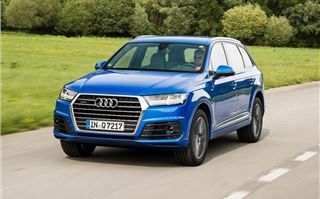 In the metal, the Q7 looks less like a bloated estate and more like a typical big 4x4, albeit one dominated by that huge Audi chrome grille. 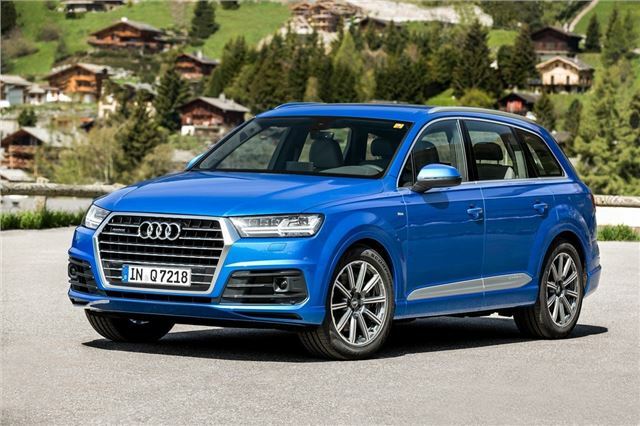 Under the Q7’s bonnet you’ll find just one choice of engine, a heavily revised 3.0-litre TDI diesel that, initially, will develop 272PS and average a very respectable official 47.9mpg. Later on, a less powerful but more efficient 218PS version will join the line-up, extracting 52.3 miles from every gallon. For now there will be no petrols, but in the future that could change with a plug-in hybrid. A more powerful V8 diesel is also rumoured to be on the way. 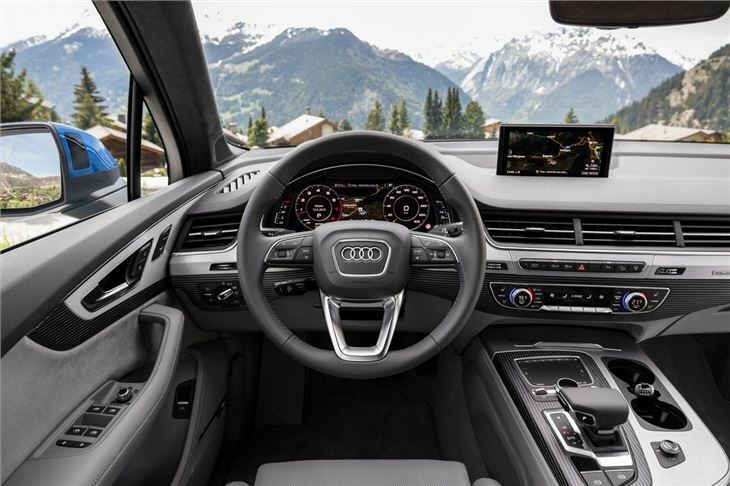 Swing open one of the Q7’s doors and you’ll be greeted by one of the best interiors in the luxury SUV class. We love the optional 12.3-inch virtual cockpit dash (£600) that’s lifted straight from the Audi TT and R8. The additional 8.3-inch monitor that rises from the dash adds to the incredible ease of use, while the standard MMI interface is as intuitive as ever. Top marks also for the full-length strip vents across the cabin that help keep the interior cool, even when carrying a full load of passengers. 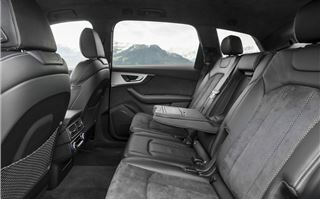 In fact, riding seven-up is more comfortable than ever thanks to generous interior space. 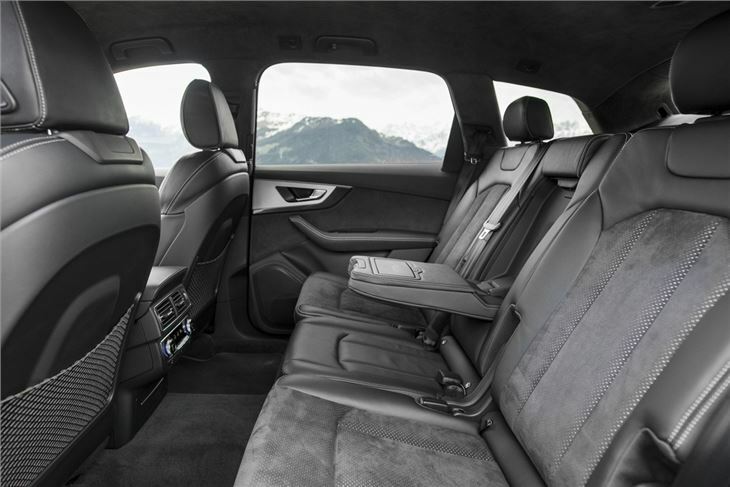 Forget the old car’s reverse-TARDIS cramped conditions - Audi has increased shoulder and headroom for the second row plus it’s now easier to gain access to the third row that. Despite no increase in headroom, it can accommodate an average-sized adult for short distances if the second row is slid forward. That third row can also be electronically lowered or raised, meaning there’ll be no more fingernails sacrificed to make more space. Furthermore, for the first time it’s also possible to carry six Isofix child seats. For our drive we tried the more powerful 272PS diesel that comes with the standard eight-speed automatic. Our car also came with adaptive air suspension and, a first for a big 4x4 class, all-wheel steering. The first thing you'll notice when you get going is the noise – or rather, the lack of it. At a typical 70mph cruise the Q7 is near silent. You'll only get noise intruding into the cabin if you work the engine hard. Next you'll notice the fine ride comfort, especially with the adaptive dampers that our Q7 had fitted. Even on huge 21-inch wheels, the ride was calm and comfortable. Leave the motorway for country roads and we have little complaint about the performance. The powerful diesel, from standstill, reaches the 62mph benchmark in just 6.5 seconds - making it faster than many hot hatches. Unfortunately, this doesn’t mean the Audi Q7 drives like a hot hatch in the corners. 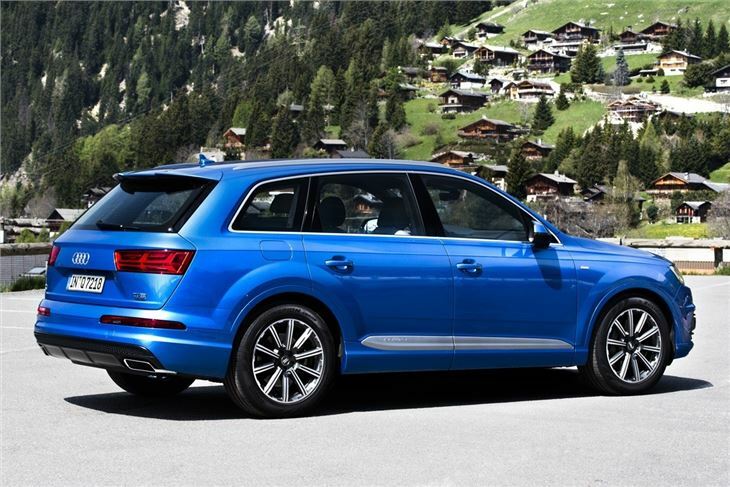 In fact, if there’s anything to be disappointed about with the Q7, it's what happens on a challenging road. Even with its Dynamic drive mode switched on, the Audi doesn’t hunker down and transform into a sports car. 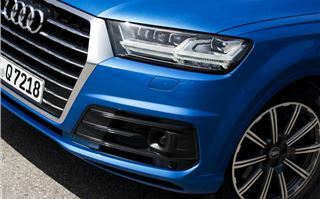 There’s too much bodyroll and, despite shedding all that weight, the Q7 still feels every kilogramme of its substantial two-tonne weight. The Range Rover Sport or current Porsche Cayenne have nothing to worry about. The four-wheel steering (£1,100) is an interesting addition. 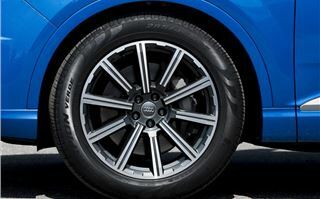 It cuts the Q7’s tendency to push-on in tighter curves, but most people will want to buy it to reduce the turning circle in town. There, plus the open road, is where the Q7 is happiest. And no doubt its unashamedly comfort bias will be most appreciated by families. Those who tow will be impressed by its Herculean ability to haul 3500kg (with the air suspension, 2700kg tonnes without). Furthermore, the new trailer assist programme can help even the most incompetent tower reverse a long, unwieldy trailer with the confidence of an HGV driver in a hurry. Comfortable, quiet, practical and more efficient. 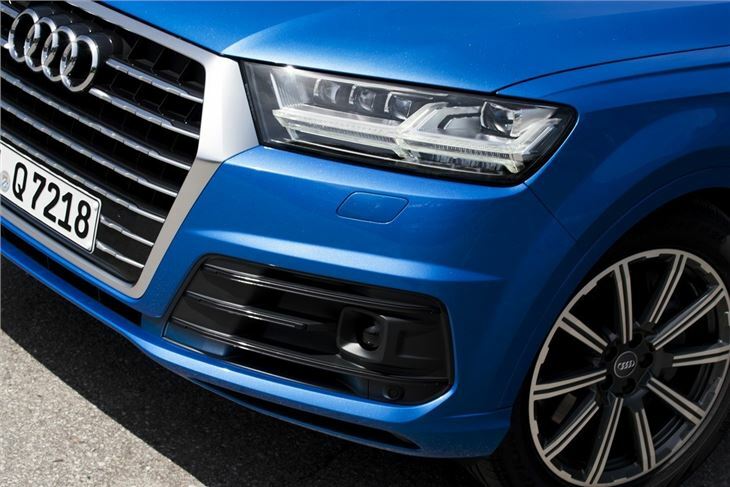 You could almost say the Audi Q7 has been worth the wait.